We’d love your help. Let us know what’s wrong with this preview of Legacy by Christopher Kellen. The Arbiter's Tower has fallen. Upon arriving in the city of Arundael, these are nearly the first words to reach the ears of the Arbiter D'Arden Tal. Less than a month after defeating the great evil inhabiting the southern city of Calessa, D'Arden and Elisa must face an even greater challenge: reclaiming the ancestral fortress from an unimaginable darkness. Worse yet, only t The Arbiter's Tower has fallen. Worse yet, only two Arbiters escaped the Tower before its destruction -- D'Arden's oldest comrade and another young apprentice. 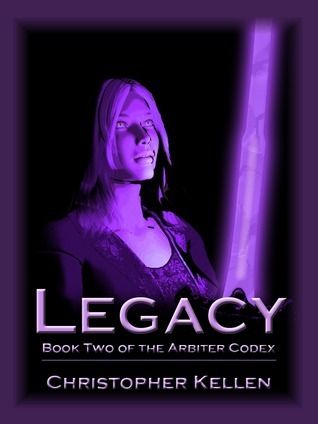 With their home overrun by darkness and corruption growing ever stronger around them, D'Arden fears that they may be the last surviving Arbiters in the world. I've been eagerly awaiting this book since I finished Elegy (The Arbiter Codex) and heard that Mr. Kellen had a sequel in the works. We pick up shortly after the last book left off, and Kellen doesn't give our heroes any chance to rest. Bigger problems abound. Actions sequences are gritty and even more epic. We find out more about the world, the history of the Arbiters, meet new characters, and some characters from the other Eisengoth stories, which I was VERY excited about. The most impressive as I've been eagerly awaiting this book since I finished Elegy (The Arbiter Codex) and heard that Mr. Kellen had a sequel in the works. The most impressive aspect of this book and Mr. Kellen's writing of it, is he wraps up everything very nicely. The book's major conflict stems from choices D'Ardan Tal make in book one, and each step of the way, the character's choices affect the outcome of the book. The most impressive part of this book is that, while it leaves things open to go in any number of directions for future books, it ties up all the problems and questions that arise from this book and the previous volume in the series. I see this so rarely in traditionally published fantasy, where it seems that editors are afraid to force the writers tie up the loose ends so they can make sure people will want to buy future books. I applaud Kellen for being able to tie up the plots and conflict central to this book while leaving us knowing that there is more, so much more to come. I was given a copy of the first book in this series (Elegy) last year and was blown away by Kellen's work. He's a newer author and while is work is still a little rough around the edges, there is so much fun and such cool stories in his books that you're willing to over look those bumpy spots. Legacy is a great new fantasy work by a up-and-coming author. I loved the first volume, loved the second volume and cannot wait for the third one! Three with flashes of five, really. Not quite firing on all cylinders, like in the Moncrief novellas, yet, but you can tell he's getting there. Rousing fun. A "must read" if you enjoy sorcery and old fashioned fantasy novels. I recommend it for it's pure entertainment.